Fresh and fruity! One of Natural Looks’ luxury perfumed body sprays. Provides a light refreshing mist of raspberry with soft floral notes to cool and perfume your body without drying your skin. A rich creamy lotion containing sweet almond oil, shea butter and vitamin E plus natural raspberry extract to moisturise and soften your skin. Fresh and fruity fragrance with soft floral notes. 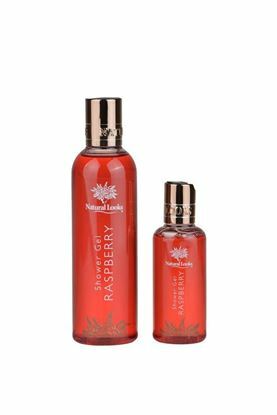 A refreshing and revitalising shower gel containing natural raspberry extract with calming and healing properties to gently cleanse the skin. A fruity fragrance with soft floral notes.